Prime Minister Theresa May faced the prospect of a historic defeat in a vote on her Brexit deal in parliament on Tuesday plunging plans for Britain's biggest political and economic change for decades into deeper uncertainty. Barely two-and-a-half months before Britain is due to leave the European Union, May's expected defeat would open a range of outcomes, from resurrecting her deal, to leaving the EU with no deal or holding another referendum that could halt Brexit. The prime minister's hopes of keeping her widely unpopular plan alive, and staying in her job, will hinge on the scale of her expected loss: defeat by a huge margin would make it harder to take the plan back to parliament for another vote. Even before the deal comes up for a vote, the opposition Labour Party will try to derail it by forcing a through a change which would reject the divorce agreement and seek to rule out the possibility of leaving without a deal. Just hours before the vote, May was meeting Conservative lawmakers to try to persuade them to support her agreement. As Britain's deepest political crisis for at least half a century built to a head, a spokesman for May said the prime minister was standing by her deal. "The prime minister said the government is the servant of the people and she believes passionately that we must deliver on the result of the 2016 referendum," the spokesman said about a meeting with her cabinet team of top ministers. "She added that after the vote has taken place, she would respond quickly to the result." May says accepting her deal is the only way parliament can fulfil its promise to deliver on the 2016 vote to quit the EU, and failing to do so would be "catastrophic" for democracy. Her ministers pressed that message. "The British people have placed a responsibility on us," Environment Secretary Michael Gove told BBC radio. "Are we going to live up to that responsibility and vote to leave the European Union or are we going to disappoint them and damage our democracy by not voting to leave the EU?" Many Brexit-supporting lawmakers from May's Conservative Party reject the deal, particularly a "backstop" requirement that Northern Ireland stay closely aligned to EU rules to avoid the return of a hard border with EU member Ireland. Dominic Raab, who resigned as May's Brexit minister in November in protest at her plans, said the government should not lose its nerve over the possibility of a no-deal Brexit, something many employers fear would mean chaos for business. But many lawmakers said they would do their utmost to block an exit without a deal. Sterling hit a two-month high against the U.S. dollar on Monday and held near that level on Tuesday, with investors viewing a no-deal Brexit as less likely as parliament's opposition to it solidifies. May reached the agreement with EU leaders in November, envisioning continued close ties with the bloc. The EU has repeatedly said it is not up for meaningful renegotiation. 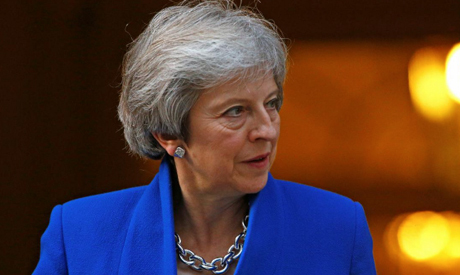 Many in May's Conservative Party say the prime minister will nevertheless probably try to win new concessions from the EU and seek another vote if she loses, even by a hefty margin. Germany's foreign minister said the EU could hold new talks with Britain after a defeat in parliament of the plan. But he ruled out significant changes. May has warned pro-Brexit lawmakers that if her plan is rejected no Brexit at all would be more likely than Britain leaving the EU without a deal. She has also warned Conservatives against allowing the left-wing opposition Labour Party to seize the initiative. Labour opposes May's deal but is formally committed to Brexit despite many party members calling for a new referendum. Labour leader Jeremy Corbyn, hoping to force a national election, is expected to call for a parliamentary vote of no confidence in May's government if she loses Tuesday's vote. "The Tory (Conservative) Party’s botched deal will be rejected by parliament," Corbyn told Labour lawmakers on Monday. "We will then need an election to have the chance to vote for a government that can bring our people together and address the deep-seated issues facing our country."